It actually conditions as you chew! Massage ribs in mouth. Let sit for 2 minutes. Swallow and repeat. Photo courtesy of Marcus Hastings. Menu found in Guangzhou, China. Waiter, there’s a hair in my shampoo. They’ll put hair on your chest! What kind of aminal has “spare” ribs. I need all of mine. I heard of a Rabbit who washed his thing. He couldn’t do a hair with it. Would you rather have real poo ribs? I prefer soap rack of lamb. We have carbon footprint, now carbon spareribs is trendy. – Look Ma, no paper! 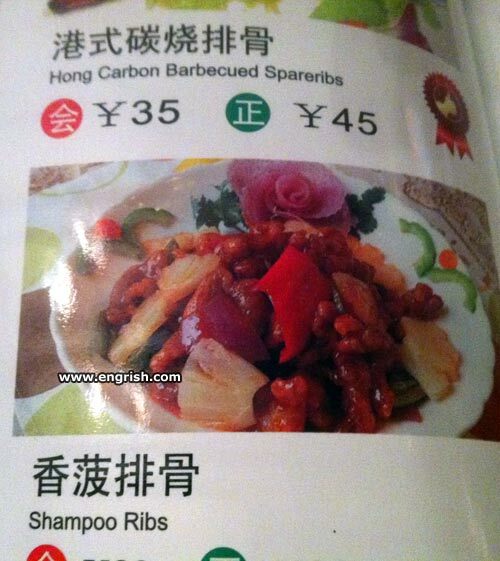 They probably meant sp’hair ribs. Repeat after me: Tickle ribs, shampoo balls. – Would you like Hairy Potter with that? The alternative to sticking a bar of soap into a child’s mouth as a punishment. ¥45 is too much toupée. – Waiter? My ribs are hairy! Personally served by the head waiter. It will help you clean your plate. So that’s what happened to Shampoo the killer whale. Takes away some of the oiliness. – And L’Oral for my wife, please. Now back at these ribs. Trump’s real plan for wetbacks? Someday you will die somehow and something’s gonna steal your carbon. Some people have a 13th rib, so that’s definitely a spare. •Try the charcoal Shwarzcough ribs – true to their name! *Ribs are also available rare, if you like them soft and manageable. If you have any enquiries about about our sausage products – Please call Johnson and Johnson. Both of those guys’ numbers can be found on the next page I think… Although I’m not 100% sure as the other menu / shampoo instruction pages are being done by someone else, so I can’t fully verify that for you..
found on the previous page. If yiu shampoo balls, the skinny bloke spits at you. Uhhh.. I think I’m too full for my conditioned ice cream sundae dessert.